The Russian Orthodox Moscow Patriarchate is at it again. Former ecclesiastical overlords have called for the submission of all Ukrainian Orthodoxy to its holiness. Initially, I dismissed the remarks as another example of imperial, delusional hubris. Normally, such conduct should not be acknowledged. On further reflection, because a deception heard often enough is often believed the matter must be addressed. Before anyone gets the wrong impression, this commentary is not about the many Russians living in Ukraine or ethnic Ukrainians who are members of the Moscow Patriarchate. Citizens who choose to be in parishes affiliated with the Moscow Patriarchate should be respected and embraced as brothers and sisters equally concerned about the future of Ukraine. Ukraine and Russia have a long, entwined, complicated history for better or worse. There is a place for the Moscow Patriarchate in Ukrainian society. It would be intellectually dishonest not to acknowledge its theological and extraordinary musical contributions. All Orthodoxy is spiritually enriched because of it. It is the unfortunate interference of high ranking Moscow Patriarchate leaders, however, that has caused unnecessary angst in the national rebirth of Ukrainian Orthodoxy. The Orthodox world has changed and there needs to be an honest acceptance of this reality by showing respect for a nation where the majority took a political and religious path that is in disagreement with the Moscow Patriarchate. Failure to do so causes needless friction. Let us remember, above everything, that we are Christians first called to fellowship before God. Younger brothers [and sisters], I beseech you. In the rays of morning. Come, embrace, my friends, brothers [and sisters]..."
As first reported on Interfax, the Union of Orthodox Citizens, which acts with the blessing of Moscow, said that вЂњattempts at creating an independent Orthodox Church in Ukraine will only weaken the schismatics and strengthen the canonical Orthodox church of the country.вЂќ The statement came after Patriarch Filaret of the Ukrainian Orthodox Church-Kyivan Patriarchate expressed an interest in a possible union with the Ukrainian Autocephalous Orthodox Church in Ukraine (UAOC). The statement by the Union of Orthodox Citizens is bizarre. Patriarch Filaret, worldwide leader of approximately 30 million Orthodox Christians has already established an independent Church. Metropolitan Mefodiy of the UAOC leads several million faithful in a church with a long history of being independent. Independent churches not only exist now, but there is substantive dialogue to unite them. The Union of Orthodox Citizens seem to have been on holiday. IвЂ™ve raised, perhaps for the first time, an important point in several prior commentaries that merits repeating. A sovereign, independent Ukrainian Catholic or Orthodox Church does not need anyoneвЂ™s permission to walk with God in the manner it thinks best. Nor does an Orthodox church, especially, need the canonical recognition of those who put organizational politics before ChristвЂ™s love of equality and acceptance. There is little doubt that Moscow will leverage its political standing in the Orthodox community to keep other churches from extending canonical recognition to sovereign, independent Ukrainian Orthodoxy. If Ukrainians are spiritually grounded and secure in their faith then it matters not what other church leaders think. The concept of canonical has taken on, contrary to everything Christ taught, an old-boyвЂ™s club mentality. Orthodoxy isnвЂ™t suppose to be an elite club where membership is extended to the servile or those who go-along to get-along. Ukrainian Orthodoxy will continue to show, as Latin and Eastern Rite Catholics do, that walking closely with God should be done without pandering to organizational politics. The Moscow Patriarchate has even sanctioned the publication of a вЂњRuthenianвЂќ bible for distribution in Transcarpathia. Although this area is primarily Byzantine or Greek Catholic there seems to be a calculated effort to divide Ukrainians. Clearly, this is not just an Orthodox matter. It impacts Catholic brothers and sisters whether they be Latin or Eastern Rite. This may be another unfortunate component of a strategy to make the rightful establishment of a Catholic Patriarchate in Kyiv more difficult. Even more disconcerting is that the approach may be a veiled attempt to encourage separatism. As noted earlier, there is a legitimate place for the Moscow Patriarchate in Ukraine. There are clearly ethnic Russians and Ukrainians who feel more comfortable with its ecclesiastical guidance. The culture, spirituality, linguistic heritage and political perspective of these ordinary citizens must be respected. The overt and often condescending behavior by their church leaders, however, merits a strong and ongoing peaceful response. 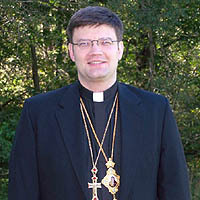 Bishop Paul Peter Jesep is Chancellor of the Archeparchy and Vicar General of Public Affairs and Government Relations for the Ukrainian Autocephalous Orthodox Church of North and South America Sobornopravna (UAOC-S). He has studied at Bangor Theological Seminary (bts.edu), the third oldest such school in the United States. In the past, His Excellency also a lawyer and political scientist by training, served on the staff of U.S. Senator Susan Collins (R-ME). Bishop Jesep may be reached at VladykaPaulPeter(a)aol.com. The views expressed here are strictly personal.